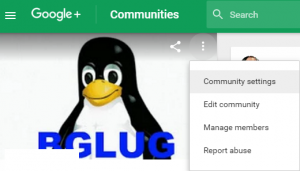 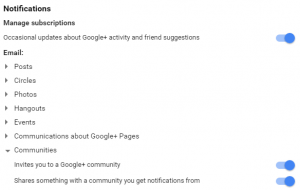 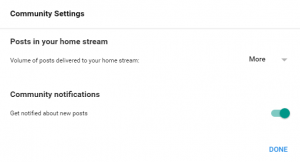 Spurred by a recent question from an acquaintance in town, I asked on Google+ whether or not you can enable emailed notifications for a Community. This led to the elaborate Settings page for G+. 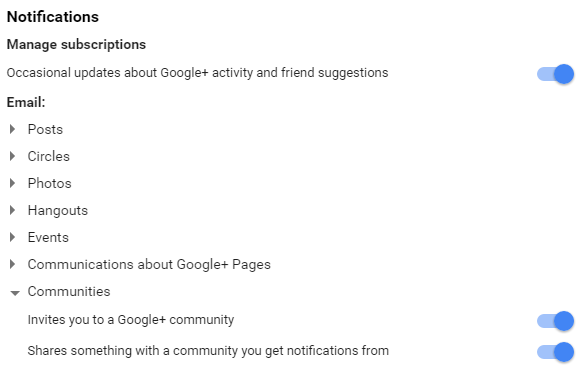 It turns out that if you combine enabling a Community’s “Community notifications” (under the specific Community’s settings (which you find by clicking the vertical ellipsis button on the Community page) with the following tree in your general Google+ settings, Notifications -> Email -> Communities -> Shares something with a community you get notifications from, you get a “mailing list” of sorts from your Community, which, niftily enough, also allows you to comment on the post via email (at least on the first notification of said post)!